I used to actually run, and I hope to get back in the game, as long as my body cooperates. So far, I’ve run a number of 5Ks, a handful of 10Ks, a 10 miler, a few half marathons and 1 full marathon. I also have a Ragnar under my belt. I don’t know that another full marathon is in the cards for me, but I can always keep the idea locked away in my mind. Running never sounded fun for me. I don’t know what it was that got me started, but it was only a few years ago that I sort of started taking it semi-seriously. I think it was my friend Megan who really got me going. And after I finally started getting up there in miles we had concocted this grandiose plan of some day running the Budapest Marathon together. She’s the one who convinced me to sign up for my first half, and we did our first marathons at the same race. My first half marathon was the Wounded Warrior Half Marathon at the Naval Base at Point Mugu in CA. My grandmother lived about 20 minutes from here, and my mom and I stayed with her the night before. I remember being terrified. I remember freaking out because it was pretty warm that day. I remember Mile 8 when I could feel the blisters on my feet. I remember calling my mom around mile 11 crying. I also remember crossing the finish line and thinking to myself “dude, you’re crazy for having done this.” I remember being ridiculously exhausted. And I remember falling asleep on the couch for like 2 hours later that day because I was just dead. 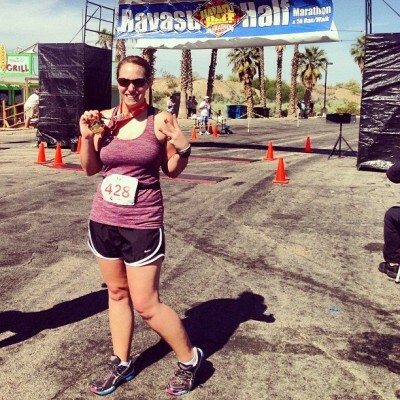 My first half marathon taught me a few things. First of all, my shoes were too small. I hadn’t trained enough. That was when I began running with a run club here in Phoenix, which met a few times per week. We had our long runs on the canals on Saturdays. We motivated each other, kept up with each other’s goals, and really had fun at races. It was with this club that I ran the Fiesta Bowl Half Marathon, and killed it. I cried at the end of this race because I really couldn’t believe that I’d done so well – I’d shaved a half hour of my half marathon time… and that time is still my time to beat – 2:32:00. Throw in a few more half marathons, a full marathon and lots of randomness, and that can sum up my running. My last half marathon I ran just 5 minutes slower than my fastest, and that was last November. I need to get back to where I was. I know it will take work, dedication, perseverance… all that and more. I’ve done it before, I just need to believe I can do it again, and get past my injuries – yay for bad knees. So my dude is a huge cyclist, and actually on 2 teams – one for road cycling and one for mountain biking. Back in 2011, he bought me my precious bike which I was totally not expecting and I loved. I rode for a while, off and on. I even joined an all-women’s riding group. Then I got hella sick after a half marathon I ran in Washington, DC and have only ridden 2 times since then. 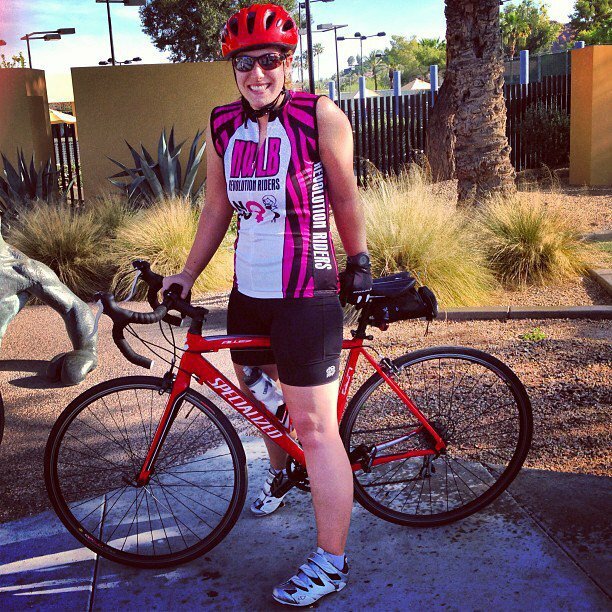 I want to get back on the bike now that my knees hate running so much. I love the feeling of being on a bike and really truly feeling the wind pass by. I love to see the sights and explore and the ability to cover so much more ground. So my goal is eventually to ride a century (100 miles). I think the furthest I’ve gone is somewhere in the 45 mile-50 mile range… I’d have to look back. Regardless, its a goal, and maybe I will get better and more dedicated and want to be on a team or something. We shall see. Most recently, I have gotten involved in CrossFit. Thanks to my wonderful yoga-teaching-side-gig, I got the opportunity to trade yoga classes for CrossFit sessions. So far, so good. I am enjoying finding my limits and pushing myself hard. I love being able to try new things, and I love that every workout is different. I am looking forward to challenging myself further and seeing where this goes.